Guillermo Maldonado is the co-founder and lead pastor of King Jesus Ministry, a Latin-American Word of Faith megachurch based in Miami, FL. Maldonado received his Master’s in Practical Theology from Oral Roberts University and a Doctorate of Divinity from Vision International University. He can be found on sub-Christian television channels such as TBN, Daystar, and Word Network, and is a regular guest on sub-Christian shows such as It’s Supernatural with Sid Roth. I was called by God 20-some years ago with a visitation. As I prayed, the presence of God filled my room. His presence fell on me and I started weeping and crying. I heard his voice say, “I have called you to bring my supernatural power to this generation.” I was on the floor for two hours, then I heard the voice again but this time inside me telling me the same thing. Maldonado is associated with the New Apostolic Reformation, as he goes by the title, “Apostle” Guillermo Maldonado. 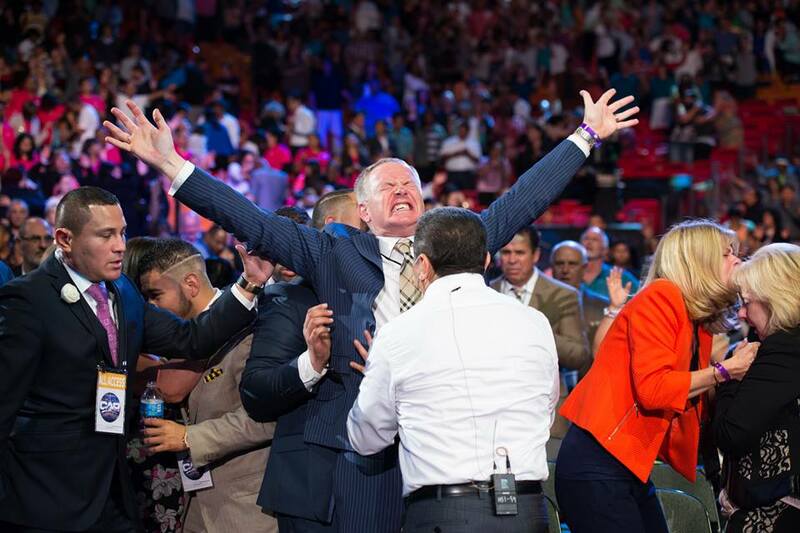 He is a growing leader in the prosperity gospel movement, especially among Latin Americans, as he proudly teaches that faith in God yields material wealth, health, and temporal blessings. Unfortunately, Guillermo is a false teacher who is leading many people astray. The New Apostolic Reformation and the teaching of the restoration of modern day prophets and apostles are unbiblical, as these offices, along with the apostolic sign gifts of healing, tongues, and prophecy all ceased at the end of the apostolic age. Further, we do not get called by God through an audible voice that tells us “to bring God’s supernatural power to this generation.” God has finally spoken to us through His Son, Jesus (Hebrews 1:1) who has called us not to bring “supernatural power,” at least in the way it is presented by these false teachers, to this generation but to preach the gospel and make disciples (Matthew 28:19). God’s Word is the supernatural power to save (Romans 1:16), and we are to proclaim it to all nations. He has opened the door to even more serious error through his teachings while garnering financial wealth for himself at the expense of his followers. In the video below, Maldonado teaches the unbiblical concept of first-fruits seed-faith tithing. He teaches that you can “activate” God’s Word and the power of redemption by “honoring God” with your “first fruits” of your income. He promises that God will “redeem” the rest of your income for a year if you will set aside a month of giving your entire income to his church. “The fasting of the first fruit has the power of multiplication…every time you honor [God] first…God will say that his money, his finances, is protected because he honored God first,” Maldonado promises. This is not a teaching that can be found anywhere in Scripture. It is a false teaching that is designed to line the pockets of false teachers like Guillermo Maldonado. Sadly, this teaching has crept into many Evangelical churches today, even in a watered-down form, it’s still dangerous. Maldonado is just another false teacher who has perverted God’s grace for self-promotion. He should be marked and avoided.